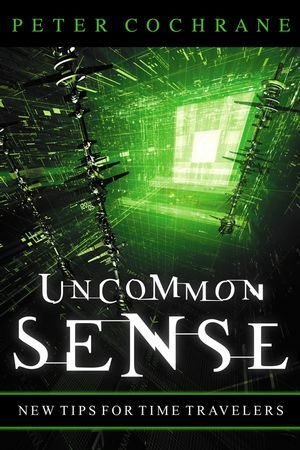 In Uncommon Sense, Peter Cochrane's follow up to the radical 108 Tips for Time Traveller, Peter explains how very simple analysis allows the prediction of such debacles as the 3G auction and the subsequent collapse of an industry, whilst simple-minded thinking is dangerous in the context of a world that is predominantly chaotic and out of control. People balked when Peter suggested a wholesale move to eWorking, the rise of email and text messaging, and the dotcom regime mirroring the boom and bust cycle of the industrial revolution. His predictions of the use and growth of mobile devices and communication, or use of chip implants for humans to replace ID cards, passports, and medical records, or iris scanners and fingerprint readers - were all seen as unlikely. Today they are a reality. How then will the world react to his predictions as set out in Uncommon Sense of a networked world of distributed ignorance and sharing overcoming an old world of concentrated skill and control? To everything becoming 'Napsterised' in every dimension, where storage and processing power cost nothing, and become connected without the help of the old network companies? A world where individuals create their own networks, where laws of copyright and resale, and old business models have to be changed as giant industries are dragged kicking and screaming out of the 19th Century and into the 21st? PETER COCHRANE is one of the sharpest commentators around on the convergence of society and business issues. He is a co-founder of ConceptLabs, where he acts as a mentor, advisor, consultant and business angel to a wide range of companies around the globe. He is the former CTO and Head of Research at BT, as part of a career at the telecoms giant spanning 38 years. He holds a number of prominent posts as a technologist, entrepreneur, writer and humanist, and was the UK’s first Professor for the Public Understanding of Science and Technology. He is the author of 108 Tips for Time Travellers.